Servo-balancing means that high common mode voltages, such as induced hum from a nearby AC line, are compensated for to preserve headroom. The input impedance of 100K Ohms allows bridging over a 600 Ohm balanced or unbalanced line with negligible loading effects. Front panel switchable 600 Ohm load allows for input line termination when required. Servo-balancing allows the outputs to be used balanced or unbalanced (single-ended) at any time by simply grounding either unused pin. The servo compensates for the voltage loss on one side so there is no 6dB loss of level. The outputs are also protected against short-circuits, so nothing is damaged if the wrong pins are grounded. A front panel indicator will flash red when the balanced output level is 5dB below clipping. Signal splitter. The 124 may be used to provide two high quality balanced outputs from a single unbalanced mono signal A?Y? connector is used to split the incoming signal to each of the IHF unbalanced inputs. Allows for the rack mounting of one or two "B" series products in one rack space. The new front panel design of the "B" series products and the new rack mount kit design makes installation 100% faster! NOTE: This kit is ONLY for "B" series units. 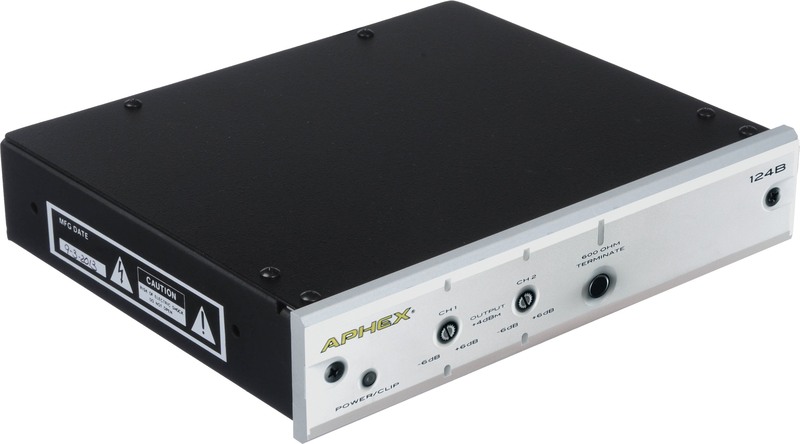 Contact Aphex for info about rack mounting kits for legacy products.